Wildland fires have many serious negative impacts on human safety, health, regional economies and global climate change. In particular, peat and forest fires in Western Russia can cause transportation of toxic fine particles to EU that are a serious health risk for the population. 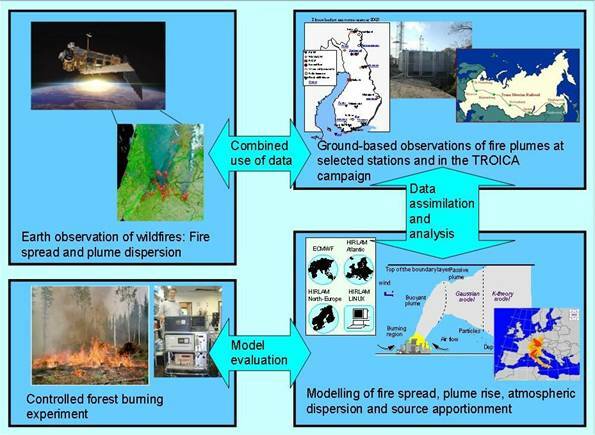 (iii) to detect the fire plumes, and to find out the source areas using a combination of ground-based air quality measurements and a long-range transport modelling system. The project has also participated in organization of controlled forest fire dispersion measurement campaign in the vicinity of the national supersite SMEAR2.